Compare below Moses Law vs. 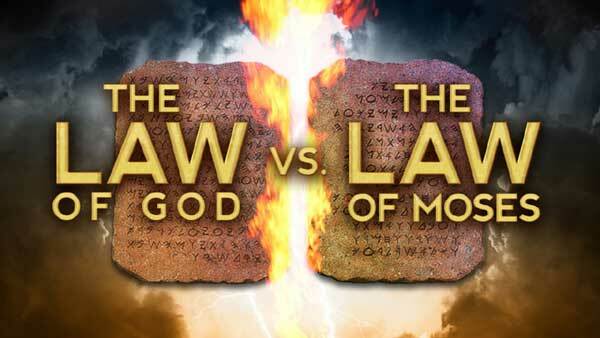 MANY people often confuse Moses Law with God's Ten Commandment Law, but they are very different. Moses' law was the temporary, ceremonial law of the Old Testament. It regulated the priesthood, sacrifices, rituals, meat and drink offerings, etc., all of which foreshadowed the cross. This law was added "till the seed should come," and that seed was Christ (Galatians 3:16, 19). The ritual and ceremony of Moses' law pointed forward to Christ's sacrifice. When He died, this law came to an end, but the Ten Commandments (God's law) "stand fast for ever and ever." Psalm 111:7,8. "Neither have we obeyed the voice of the LORD our God, to walk in his laws, which he set before us by his servants the prophets." Special Note: Please note that God's law also called the 10 Commandments has existed at least as long as sin has existed. The Bible says, "Where no law is, there is no transgression [or sin]." Romans 4:15. So God's Ten Commandment law existed from the beginning. Men broke that law. "Whosoever committeth sin transgresseth also the law: for sin is the transgression of the law." 1 John 3:4 Because of sin (or breaking God's law), Moses law was given (or "added" Galatians 3:16, 19) till Christ should come and die. Two separate laws involved: God's law or 10 Commandments and Moses law. Called "Law contained in ordinances"
EPH. 2:15 Having abolished in his flesh the enmity, even the law of commandments contained in ordinances; for to make in himself of twain one new man, so making peace. 2 CHRON. 35:12 And they removed the burnt offerings, that they might give according to the divisions of the families of the people, to offer unto the LORD, as it is written in the book of Moses. And so did they with the oxen. COL. 2:14 Blotting out the handwriting of ordinances that was against us, which was contrary to us, and took it out of the way, nailing it to his cross.